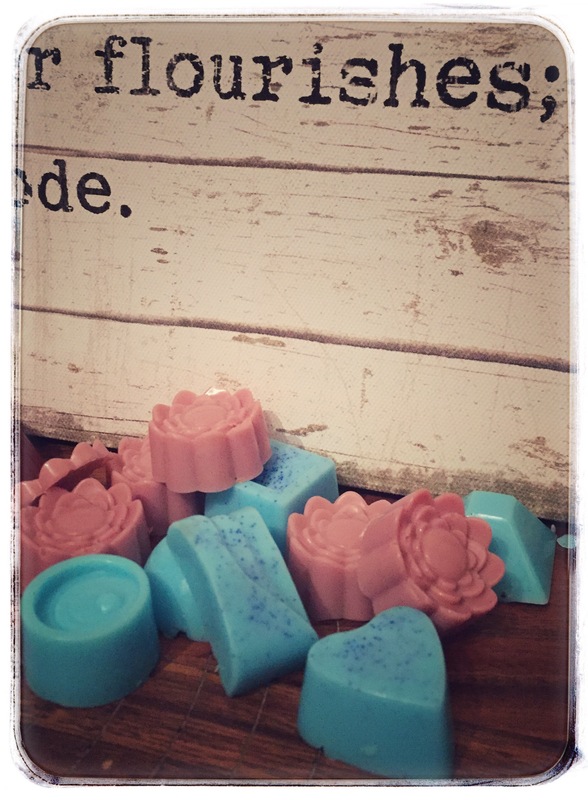 Using small moulds to make mini soaps is an awesome idea and doesn’t cost the earth. Try using an ice cube tray to make small cube soaps. Then be as inteventive as you want. Because they are mini, you can make a small batch of 2-5 one inch cubed soaps and not worry about having excess of soap mixture to worry about if it doesn’t turn out how you want. I add glitter, dried flowers, soaps within soaps, colour layers and more. Here are some moulds filled. They are the size of 50p and make awesome little gifts. Select your Melt & Pour base. Cut into cubes and melt using a microwave or bain-marie. Add the colour and scents you desire. Pour into the mini moulds. Spay the top with rubbing alcohol to release the bubbles. Let it set for at least 2 hours but preferably 24 hours. Pop them out of the moulds and allow to sit for another 24 hours. Wrap up or put them in little gift bags, perfect for friends or family. Here are the finished soaps. Mini pink and blue sparkly soaps. All shapes and colours.